History Channel's 'United States: 1865 to the Present' is a new course at the University of Oklahoma. Many college kids spend hours watching The History Channel. Now, students at the University of Oklahoma will be able to get college credit for it. 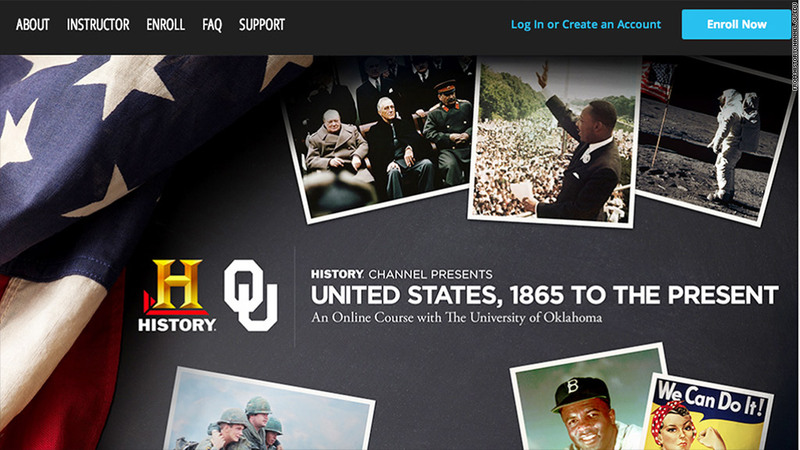 On Tuesday, the History Channel announced a partnership with the University of Oklahoma that allows for the first ever TV network-branded online college course for credit. "I think it's a great way of combining the talents of the History Channel... with the intellectual rigors of a college class," said University of Oklahoma professor Steve Gillon, who will teach the class. "United States, 1865 to the Present" will be a 16 week interactive online course that will include all the standards of your regular collegiate history class (quizzes, lectures, etc.) along with supplemental material from the History Channel. Gillon, who also works with the History Channel as Scholar-in-Residence, explained that students will be able to do work while also delving into the archives of the channel. For example, two weeks of the course focus on the 1960's, so students will able to do readings on John F. Kennedy alongside watching clips from his 1963 assassination. "Television networks have the thing we don't have in the academy, which are the images," Gillon said. "As professors, it's really hard for us to do these things because there's all these rights issues." The course will cost students $500 which Gillon says is cheaper than even some community college courses, and even students who don't attend Oklahoma can sign up for it. Enrollment for the class opened up on Tuesday and it will be in session starting next semester. Gillon thinks the interactive course will be beneficial to today's college students, who are more likely getting their information on visual platforms. As for future classes focused on some of the History Channel's other subjects like Bigfoot, Gillon laughs saying "god, I hope not."